Weather conditions obviously have a major impact on the activities at SatTrackCam Leiden. Last two weeks for example have seen a lot of snow, and consequently clouded skies. I have had an outdoor thermometer for some time, but manually logging a strict temperature record proved too cumbersome to uphold. 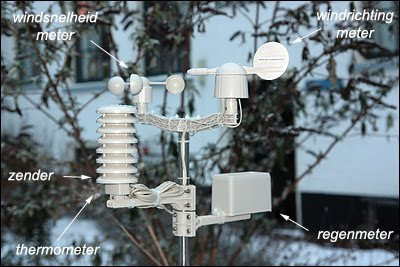 However, as of this week I have a fully computerized weather station here at SatTrackCam Leiden which logs information on temperature, air pressure, wind, air moisture and rainfall on a 15-minute basis. The station sends the data wireless to a receiver in my home, where it is logged in the receiver memory. The receiver can be attached to the pc by USB. Hence, I now have the opportunity to record basic weather data in detail for my location. 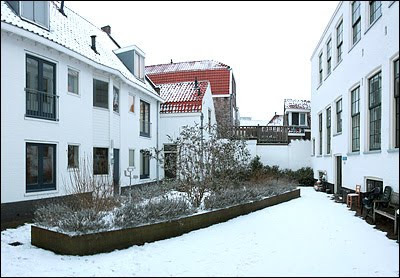 Below pictures show the basic outdoor rig, and a picture of SatTrackCam Leiden in the snow on january 10th.